Inviting candidates to take a test is one of the most common activities for a recruiter on our site. Today we are launching a fully revamped test invite workflow to make this repetitive process more efficient for our users. The new interface is shown in the screenshot below. The first thing you would notice is the entire interface has been cleaned up. We have also addressed some common concerns raised by our users. Finally we have added a few nifty new features as well! 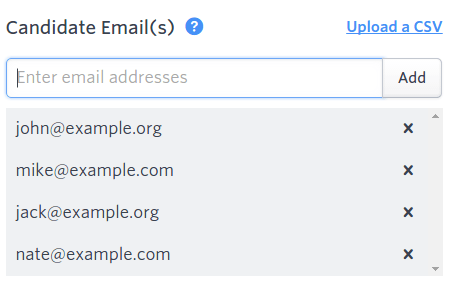 As before you can paste a comma separated list of email addresses in the input box. With the new changes you will be able to review the added candidates and edit the list if you so wish. Duplicates are automatically purged from the list. We also have a bulk upload facility, whereby you can select a CSV file containing name and email addresses in a specific format. 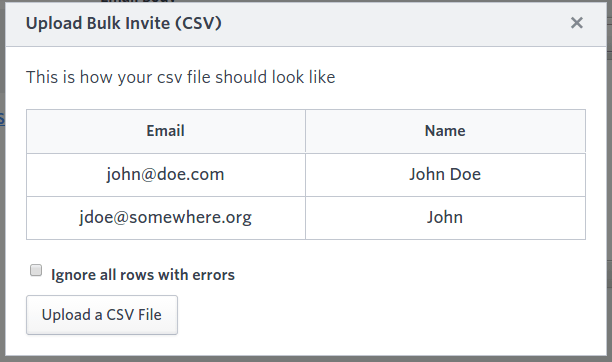 When a CSV is selected, the invite form is populated with email ids in the file so you can review and process them. We’ve always had a Preview Invite option that allowed you to see the format of an invite. Some of our users wanted more. So we added yet another way to keep tabs on what we send to candidates on your behalf. By checking the ‘Send copy to myself’ box you will be added to Cc: on the actual email sent to each candidate in your invite list. Beware! If you have 100 candidates in your invite list, you will receive 100 emails! Our invite flow had some rarely used settings for some advanced users. In the new interface we have hidden those behind the ‘advanced settings’ link. Be sure to check that out, though. There are some useful features, like candidate tags, that can come in handy in some scenarios. The biggest improvement, though, is not as visible as the above changes, but is guaranteed to be most useful to our heavy users. We have totally revamped the backend processing engine to ensure that your invite list is processed in the background. This means you can send invites to one thousand candidates at a time, and go on to attend to other things while our system processes the invite list. In the earlier flow, the browser would have hung waiting for the server to complete inviting everyone. It is likely the process would not even have completed successfully. We have fixed these problems for good. As soon as you press Send Invites you will be taken to the ‘Invited’ page for that test, where status of invited candidates will start appearing as and when they are processed. Depending on the number of candidates you have invited, they might not all appear on the Invited page immediately. You may have to refresh the page a few times or come back to the page after attending to other pressing matters! We are investing a lot of time into making your most common tasks intuitive and pain-free. Let us know what you think of this change, and any other changes you would like to see in the product!